Our festival posters are popping up all over the place. Have you spotted one yet? If yes, you best remember where it was, and get yourself back there – asap. 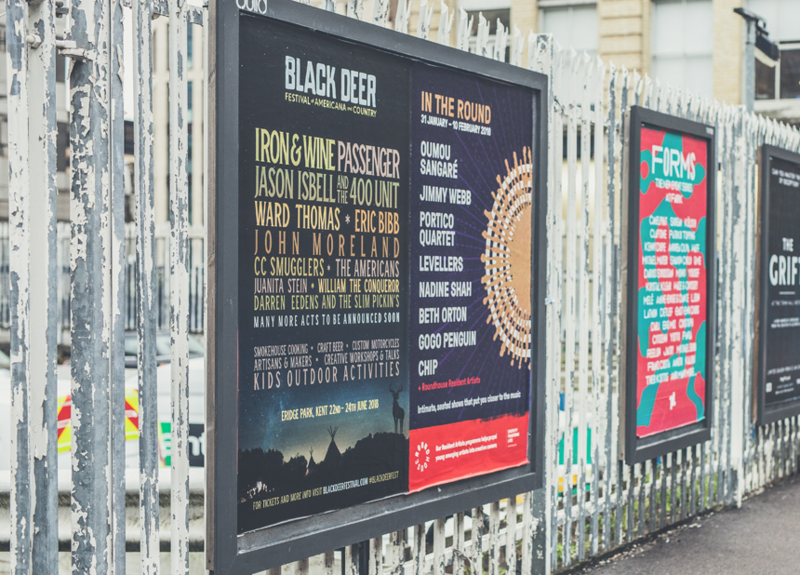 Because, if you take a photo of one of our posters and then share it with us over on our Facebook page, you’ll then be in with a chance of WINNING TWO ADULT WEEKEND CAMPING TICKETS TO THIS YEAR’S FESTIVAL. Entry is simple. Just head on over to the Black Deer Festival Facebook Page and comment on our poster post, with a pic of your sighting. And don’t forget to tag in your mates when you do – to give them the heads up too. We look forward to seeing your entry. And then, fingers crossed, welcoming you to the Deer Park this summer – for a weekend celebration of all things Americana & Country. (T&C’s apply. To be found at the bottom of this page). 2. This promotional free prize draw is open to residents of and visitors to the British Isles, aged 18 years or over, except employees (and their families) of BDLL. 3. This promotional competition is restricted to one (1) entry per person, aged 18 years and over. Proof of identity and age, may be required. 5. Entries made online using methods generated by a script, macro or the use of automated devices will be void. 6. No responsibility can be accepted for entries lost, delayed or corrupted, or due to computer error in transit. 7. The weekend camping ticket prize, is not transferable to another individual and no cash or other alternatives will be offered. 8. The weekend camping tickets may not be used in conjunction with or in addition to any other discount, concession or other special offers or competition entries/prizes. 9. Exchange, re-sale or sale of the weekend camping tickets is strictly prohibited. 10. The winner(s) is(are) responsible for all expenses and arrangements not specifically included in the prize. 11. The promoter accepts no liability for lost or stolen weekend camping tickets. 12. The promoter accepts no responsibility for loss of property/injuries/or accidents that may occur during your visit to the festival, or whilst taking part in any of the activities at the festival between 22nd to the 24th June 2018. 13. The promoter reserves the right to withdraw, amend or replace this offer without prior notification. 14. The validity dates of the entry to the promotion commence at midnight on the 1st February 2018 and expires at midnight on the 4th February 2018. 15. Only one prize will be awarded. 16. The prize is: two (2) weekend camping tickets to be redeemed only at the Black Deer Festival 22nd-24th June 2018. 17. The winner(s) agree(s) to the use of their name, photograph and disclosure of county of residence and will co-operate with any other reasonable requests by BDLL relating to any post-winning publicity including but not limited to, digital and printed media, printed or digital magazines, radio and all social media platforms. 18. Unless stated otherwise the winner(s) will be drawn at random from all correct entries received by midnight on the 4th February 2018. 19. The winner of the free prize draw will be notified by BDLL in writing, on the 5th February 2018. 20. Failure to respond and/or provide an address for delivery, or failure to meet the eligibility requirements may result in forfeiture of the prize. Where applicable, the decision of the judges is final based on the criteria set out in the promotion and no correspondence will be entered into over this decision. 21. Reasonable efforts will be made to contact the winner(s). If the winner(s) cannot be contacted, or are unable to comply with these terms and conditions, the Promoter reserves the right to offer the prize to the next eligible entrant drawn at random. 23. A list of the winner/s will be available by writing into the promoters website after the closing of the competition. Only the surname, county and country of the winner/s will be disclosed.